The profile of a step and the skirting of the stairs are details, functional and aesthetic, very important to characterize a flight of stairs and make it more accessible. When designing a house on several levels, we must address the problem of integrating the stairs to the vertical connection. As of now the major concern is the form to be taken: a ramp in a linear, angular or spiral shape; then follows the choice of material such as wood, stone, steel or reinforced concrete. The project of a flight of stairs requires professionalism; The connection must be designed as to be comfortable and you have to deal with the space that you have available and the safety rules that suggest formulas for sizing each step in the tread and in the pull. Very often the buyers ask us architects to increase the raiser to save space by reducing the number of steps, but this involves forced displacement and a use of the link definitely less smooth. Comfort is instead the first place, considering the changing needs of users. An important aspect to focus on is the choice of the right profile, element that characterizes a flight of stairs from a point of view both of aesthetic and functionality. It is a detail to be chosen carefully to ensure a safe and comfortable enjoyment; to allow the foot to lie down naturally and without step force. In the image below, sketched by hand, are shown the different profiles that vary in both form and material. The profile is the contour line determined by the section of the step, while the limbello is a recess with a rectangular section formed in the stone lining of the riser. 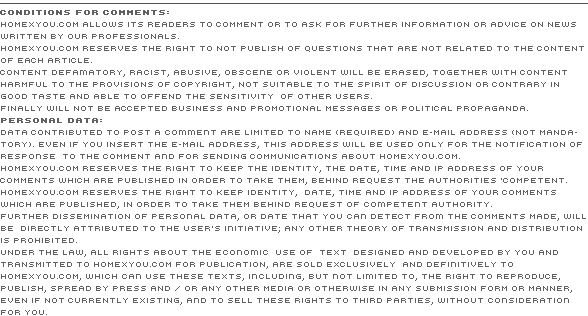 In this solution we see the tread (or step) to protrude slightly compared to the riser (or under riser) and present a rounded edge; the indentation marks the top of the riser. The two rectangular section recesses are placed at the top and bottom of the riser, also the tread aligns with the outer profile of the under risers. The recess is made in the lower part of the riser and the external profile of the latter protrudes slightly with respect to the tread, which has a board bird's beak or bird processing. The limbello is placed at the top, a slope of the remaining 2/3 of the riser faces the inside and the tread doesn't protrude from the riser. Example of a monolithic profile in which is lacking the protrusion of the tread on the riser, which sacrifices comfort and design logic. The tread protrudes slightly with respect to the riser which is sloping, not perpendicular to the degree of the step. The upper part of the riser, of about 2/3, is highlighted by a frame slightly protruding created by the profile of the tread and by the remaining 1/3 of the under riser. Often, the area in the frame is made of a stone different from the one of the step and its outer edge protrudes slightly with respect to the under riser. The central part of the riser is fully framed and presents a different stone, also the tread protrudes enough with respect to the under riser. The tread and rise are made of different material and the latter is not squared in the front but oblique, protruding with respect to the under riser. The tread, made of stone, has a recess in the inner face to accommodate the clutch with the wooden riser and protrudes with respect to the under riser. The tread and the riser are made of different materials for a singular aesthetic effect, also the projection of the step is guaranteed. The tread and the riser are made of different materials, and the latter, undercut inclined, has a lower limbello and metal studs for anchorage. 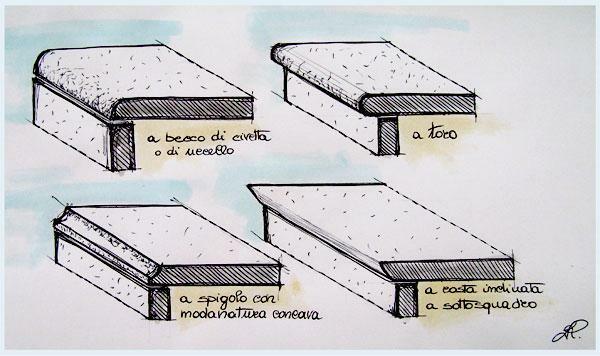 The steps, therefore, can be designed with different profiles and in the choice of this particular, you should also look after the working of tread-edge in its possible variants designed to take special moldings: bull, an edge with concave profile, bird's beak or bird, undercut inclined edge. 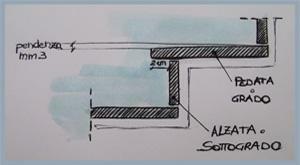 Another detail to evaluate, sketched in the image below in different solutions, is a protective element of the lower part of the wall, joined to the flight of stairs, called skirting. 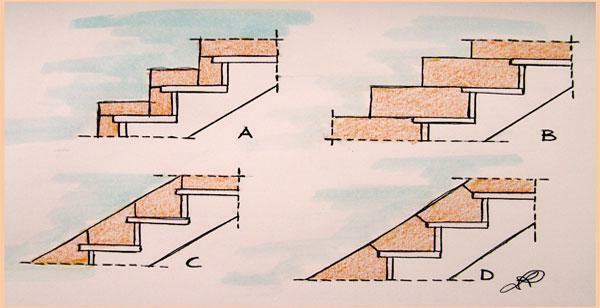 The variants are constituted by a skirting board in terraced steps with a height less from the riser (A), terraced steps of equal height to the riser (B), continuous skirting with vertical connection (C) and continuous with perpendicular connection to the slope (D). Summarizing we can say that the optimal solution is to have a continuous step profile and with rounded edges, a sloped riser with respect to the tread so as to form an angle of 75-80°, the projection of the step with respect to the under riser of minimum 2 and maximum 2.5 cm. Valutation: 0 / 6 on 0 votes. Joined the REA 841143/NA 26/01/11. Capital fully paid 15.77 k.